The national dialogue around sexual harassment is a watershed moment for our time. This isn’t just a female problem. Men and women must work towards a solution together. 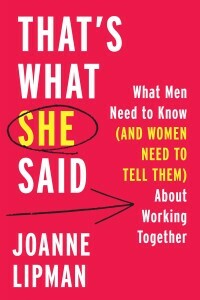 In her new book, That’s What She Said: What Men Need to Know (And Women Need to Tell Them) About Working Together, veteran journalist Joanne Lipman explores how men can join the conversation to close the gender gap—including steps they can take right now to move toward a solution. In the introduction titled, “Men Aren’t the Enemy.” Lipman says it’s important to refrain from male-bashing while looking for solutions to promote equality for women on the job. We are proud to share Men Aren’t the Enemy, an excerpt from THAT’S WHAT SHE SAID: What Men Need to Know (AND WOMEN NEED TO TELL THEM) About Working Together, by Joanne Lipman, published by William Morrow. This book began with a flight to Des Moines. In most ways, it was uneventful. The businessman sitting next to me couldn’t have been friendlier. Over plastic cups of white wine, we chatted about his business, his new house in a New York suburb, and his kids’ sports teams. Then I mentioned I was on my way to speak at a women’s conference. Suddenly my neighbor froze. The words tumbled out of him. The facilitator had beaten up on him and his male colleagues, he said. It felt like being sent to the principal’s office, or being sat in the corner. Hours of his life, wasted. And the message he and his male colleagues took away, he told me, boiled down to one accusation. My seatmate’s words struck me. The truth is, I’d heard some version of them dozens of times before. I’d seen the body language, the Don’t yell at me! flinch, more times than I cared to remember. I’d watched self-assured, confident men curl into that defensive crouch when the subject of women—or God forbid, the phrase “gender equality”—had come up. The next morning, several hundred women gathered in a hotel ballroom. I had been invited to speak about some of the most common issues women face at work—being overlooked in meetings, being underestimated, watching men getting credit for our ideas. As I spoke, I watched those several hundred female heads nodding in recognition. “We already know all of this,” I said. “We need men in this room to hear the message instead. First things first: There will be no man shaming in That’s What She Said. No male bashing. No finger-pointing. Women, meanwhile, have pretty much wiped our hands clean of men, cutting them out of the conversation altogether. An entire industry of books, conferences, and networking groups has blossomed to tell us that closing the gender gap is up to us, not them. We’re told we need to speak up, to be more confident, to demand to be paid what we’re worth. We talk endlessly among ourselves about all of this. What we don’t do is talk to men about it. That disconnect between men and women makes no sense to me. If women only talk among ourselves, we can only solve 50 percent of the problem. We need men to join the conversation, to be our partners. And as for the men, most of them aren’t anywhere near villains. They don’t need beating up with a two-by-four. They’d like to see an equitable workplace, they just can’t figure out what they’re supposed to do about it. Copyright © 2018 by Joanne Lipman. Reprinted courtesy of HarperCollinsPublishers. 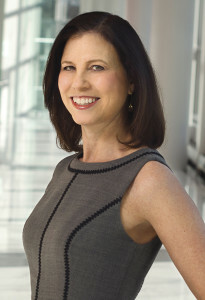 If you’d like Joanne Lipman to speak to your organization on topics including women in leadership, sexual harassment, unconscious bias, bringing men into the conversation about closing the gender gap, or the future of media, please contact Lisa Reiter of WME at lreiter@wmeentertainment.com.